I was at the peak of my physical fitness and at my most optimal weight back when I was 25. Now I’m 52 and retired I decided that I would try and return myself to that same position, when I was able to commute 25 miles to work on my bike each day, do a decent strength workout, hike for 6 hours easily and weigh in at about 10 stone 7, or a BMI of 22, which is right in the middle of the healthy range. I don’t want to be any lower than this as I think it’s important to carry a little spare fat as an insurance policy against illness, I’ve often lost half a stone during a bad flare for example. Achieving these objectives has been surprisingly difficult, because of my auto-immune condition and regular flare-ups I’m not able to do high intensity exercise, and I need frequent breaks and sometimes flares enforce breaks for a week or more. My body bas clung on to that last 10 lbs. of fat with incredible tenacity, regaining anything I loose incredibly quickly as soon as I return to eating normally. But I’ve finally done it. 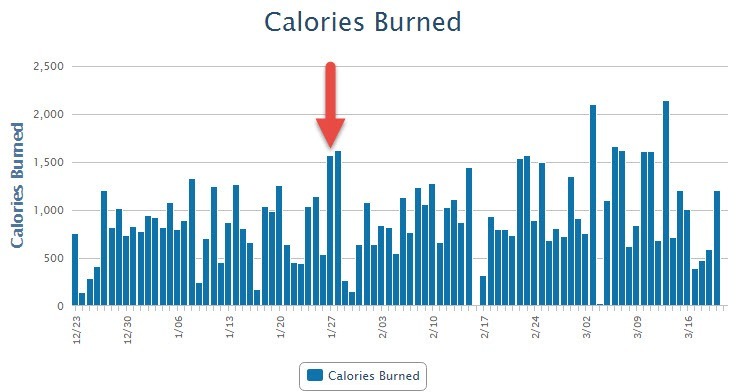 The breakthrough came when I switched from general calorie reduction to a combination of alternate day fasting and low intensity, long duration exercise. I lost all the weight quickly and easily, I built up my strength and endurance and,so far as I can tell, I lost almost no muscle, in fact I may have put muscle on. 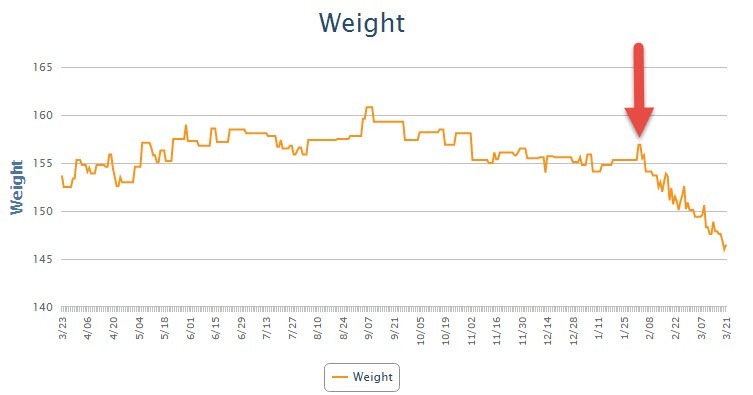 As you can see the weight really fell off a cliff (I started at the red arrow), in a way that I’ve never been able to achieve before, and I rarely felt hungry, knowing that tomorrow I would be eating normally always gave me enough willpower today. 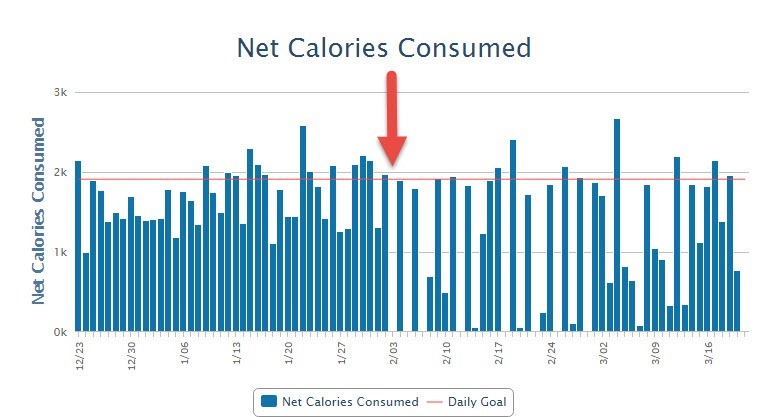 I stuck pretty well to the alternate day fast schedule (started at the red arrow), my net calories were very low on fasting days because I did a lot of exercise, but I didn’t go crazy on non-fasting days, although I still ate well because I exercised on those days too. Some days my net calories were low for a few days, because I did so much exercise, working on my allotment. 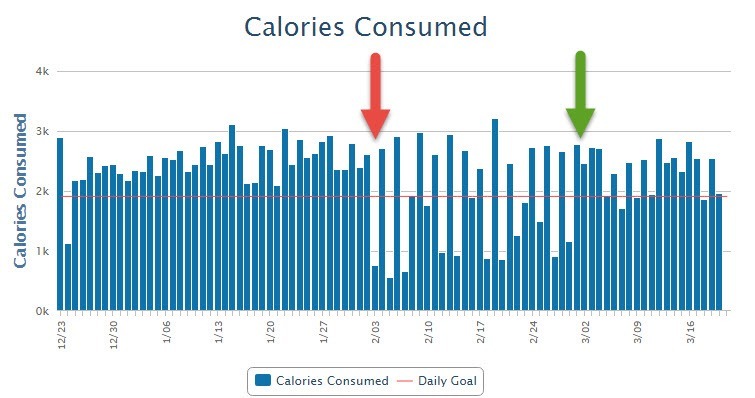 Taking a look at gross calories you can see that I definitely wasn’t starving myself, particularly in the second half (green arrow) of the fast where I was making sure that I didn’t loose muscle and kept my energy levels high and made sure I was eating a very nutritious diet. I was very concerned about losing muscle, so I made sure to eat plenty of protein, and do a mix of strength and endurance exercises. I didn’t go to the gym, but did plenty of walking, cycling and heavy work on the allotment. As you can see I lost mostly fat. 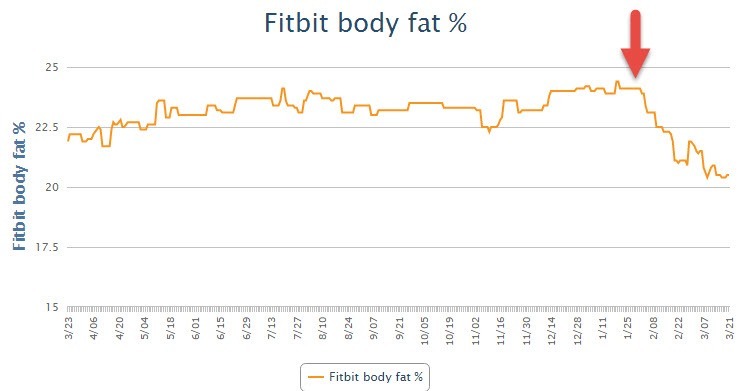 Although I increased my exercise a little (from the red arrow onwards) It wasn’t too big a change for my body from my usual pattern. This means when I reduce it again going forward I shouldn’t put the weight back on. 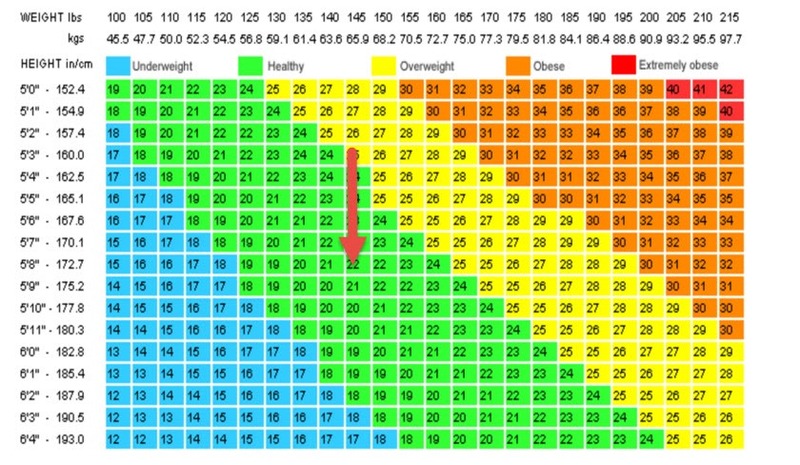 I ended up where I wanted to be, right in the middle of the BMI chart, healthy, but not under weight and carrying a little spare for emergencies. I still have an inch or two to drop on my waist size though, but that will be a gradual process over the next few months. Right now I’m eating normally 5 days a week, with two fasting days, which will be combined with high exercise days. Once I reach my target waist size I will switch to two fasting days a month. Finally it’s worth noting that I’ve never felt better, I’ve been eating plenty of high quality food and doing exercise out in the wild, which I enjoy so much more than the gym.